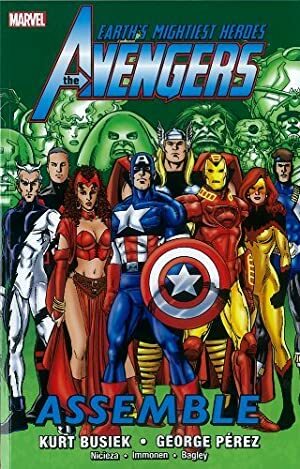 Triathlon is an Avengers ally who appeared in 1998, as part of Kurt Busiek’s big and involved Triune Understanding storyline. This profile was done very early in Triathlon’s career, so at lot of the material (such as the exact ties with the legacy of the 3D-Man) had yet to appear. Our usual policy is to wait for a good while until there’s enough material to analyse but heh, sometimes enthusiasm happens. Real Name: Delroy Garrett Jr..
Group Affiliation: The Triune Understanding. Base Of Operations: Triune Understanding World Headquarters and Resource center, Calleyville, Texas. Triathlon has three times the power of peak human capacity. He is 3 times as strong as a man can get, 3 times as fast, 3 times the reflexes, the senses the stamina. 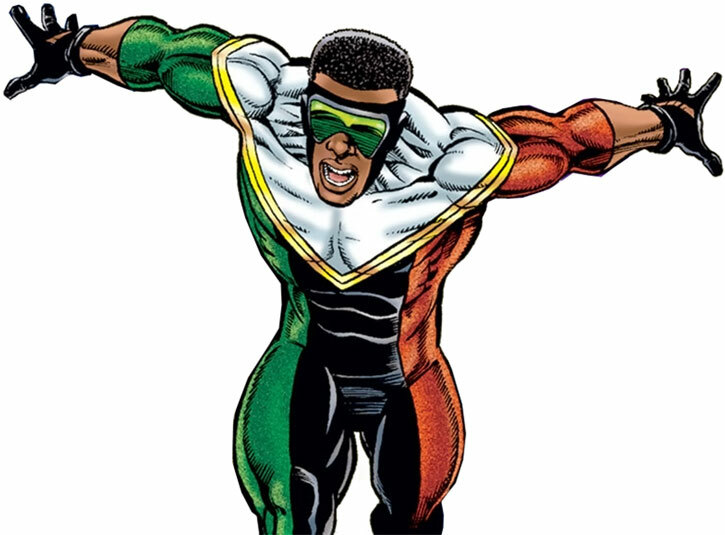 Even before he received his powers he was an Olympic athlete who specialized in sprinting. This makes him incredibly fast on his feet, and surprisingly effective in hand to hand combat. Delroy Garrett Jr. was an Olympic sprinter destined for the gold. So driven was he to win, he started taking steroid supplements. Soon after he was discovered and banned from competing, and was stripped of all his medals. Distraught and directionless, he wandered aimlessly through life. Soon came upon a religious group called the Triune Understanding. They gave Delroy the direction he so desperately sought. They also mysteriously helped unlock the amazing power within him. 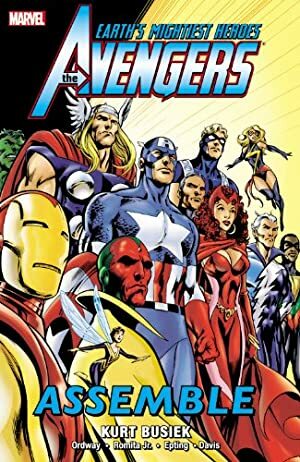 Soon after Triathlon helped the Avengers against Moses Magnum. He encountered them a couple of times thereafter -as an agent of the Triune, whom the Avengers suspect of foul doing. Jonathan Tremont, the leader of a Triune, was later revealed to have built up this organisatioon to oppose an ancient threat, the Triple Evil. Unfortunately, the power he had amassed in order to do so had corrupted him. 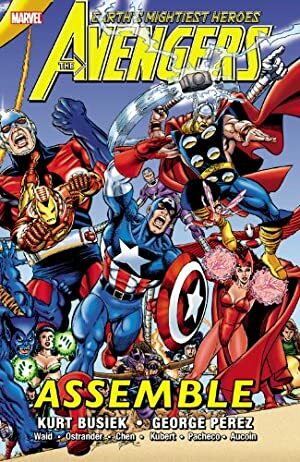 Seeing the insanity and evil in Tremont, the shocked Triathlon turned against him and defeated the Triple Evil, thus proving himself a hero and gaining the trust of the Avengers. Delroy is a Black man in his mid-20s, with a lean but muscular build, sporting a then-modern flattop fade. 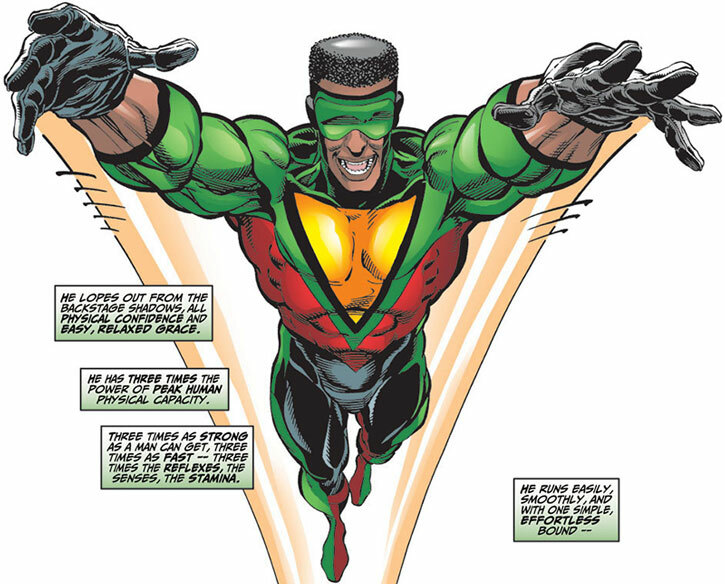 As Triathlon he wears an updated version of 3-D Man’s costume complete with visor and a yellow triangle on his chest pointing downwards. His outfit is primarily black and green with some red. His visored cowl leaves his hair visible. Triathlon is extremely confidant in his abilities, perhaps somewhat overconfident. He is somewhat irreverent, similar to Spider-Man in combat but less so. When speaking of his religion he is always serious. He displays a charismatic honesty when addressing crowds. 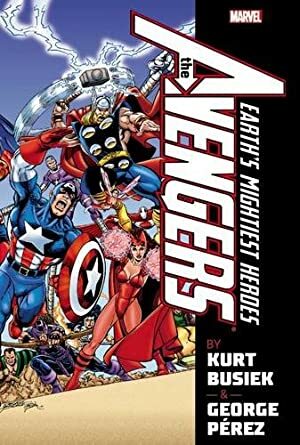 Despite the Avengers suspicions of the Triune Understanding, he seems to be a genuine hero. Is he some witless pawn in some sinister plot or a willing agent of the dark forces behind the Triune ? Only time will tell. Lightning Reflexes, Local Hero (Triune followers). Triune Understanding (High), Avengers (Low). Dark Secret (he is hiding something), Public ID, SIA to protecting Triune Understanding.